I was saving this post for tomorrow, but since I recevied SO many emails yesterday from people truly not knowing the difference between Jack Rogers and Stephen Bonanno Sandals. Some, unfortunately, even thought Jacks ARE Bonannos! Just a named style. Oh, no no no no no no! So, let's set the records straight, shall we? New cork by Stephen Bonanno Sandals.....I LOVE these sandals!!! Can YOU tell the difference??? I can. I have nothing against Jack Rogers, I just prefer Stephen Bonanno Sandals. 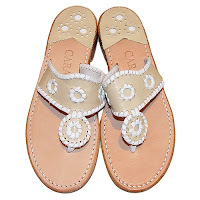 After all, they are the original, the ones Jacqueline Kennedy wore (yes, that’s correct….those are SBS not Jack Rogers as is the common misconception). Did you know that EVERY SINGLE PAIR of SBS from beginning to end is handmade right here in the grand ole USA! That’s right. 100% AMERICAN HANDmade. Jack Rogers, it is rumored, have parts of their sandals made overseas and then assembled in Miami, though I’m not 100% sure about this. Picture of the American flag hanging in the SBS factory. It was Stephen’s brother David’s flag, who served in the military for 20 years! SBSs are 100% leather. The tops are made of the finest kid skin dyed leather. JR’s are part leather and part synthetic manmade materials (a/k/a vinyl) the tops are calf skin which makes it a little less supple and painted which leaves the color a little less vibrant. Look at all the colors!!!! SBS are true B width with whole and half sizes. JR’s run narrow and don’t have true half sizes (we think they are whole sizes with wider tops). The last pair of SBS I had made, I ordered a size 7 sole with a 7.5 top because the top of my foot is a little wider. Now, that’s customer service – a sandal custom made to fit your own foot! SBS has about 67 colors with endless color combinations with the color selection growing every day! You can choose your own combination. With SBS, if you want Florida Gator sandals – you can have Florida Gator orange and blue sandals! Cardinals sandals, red and white with a cardinal embroidered on them. SBS has a repair department and you can get your shoes re-soled when they get worn out for only $56.00. Case in point: I need a repair on my Emma’s, which I told Stephen about when I toured the factory. Without question, Stephen said he will repair them asap at no charge as they stand behind their product. This is not verbatim, but he stated that this is their family product, his family works on this product, their non-family employees are their family and they will do whatever they can to give excellent customer service. With SBS, if you have a problem, you talk directly to the hand-crafter of the SBS. You talk to Vivian, Stephen or Domenick (who are all in the family). Do you get that with JR’s? Not sure, I don’t own any! MYTH: Jaqueline Kennedy wore only Jacks. MYTH: Jack Rogers and Benny Bonanno (the SBS creator) are brothers who had a falling out and went their separate ways. FACT: Jack is not a part of the family and they’ve never met. MYTH: JR sandals made Oprah’s top 10 O List in 2002. FACT: Those were Stephen Bonanno Sandals and Oprah’s producers wear SBS now too! MYTH: Lilly Pulitzer and her daughters only wear Jack Rogers. FACT: Lilly Pulitzer herself, and her daughters would go directly to the SBS factory to get their sandals. Stay tuned as tomorrow, we have some other VERY important information on some other copies of SBS! Also, the details about the upcoming contest will be revealed! Ooo what a very informative post! I knew they were different brands, but I didn't know all the rest. This is so informative! Thanks for sharing! Great post!!!! I love my SBS! The more I learn about SBS, the more I love. I'm a huge supporter of "buying local" and supporting your community. I love that the SBS company is 100% American, although, I do like a nice Brazilian shoe....don't get me wrong. So I went on their website and read it ALL. I'm in the know about the SBS now. You can also tell the difference by the little triangular piece around the toe. Those are the "originals" and the others are the knock offs. I love that the company is so "family friendly". You don't see that in large, successful companies anymore. AND....they stand behind their work 100%. I think I'll sell my JRs on eBAy and buy SBS from now on. Great post. As a Florida girl, I'm partial to Bonannos, too, especially since the one pair of Jacks I had broke! I'm not sure about the validity of anything... but the only thing I really know is that Jacks fit my feet SO much better! haha I have to go with the shoe that feels better. I cannot get my feet into Jacks. They are horrible. Love my Bonannos and Jacks ~ even Salarios. They all wear well and have lasted many many seasons. My Jack's do run a tad narrower than my Bonnanos but still fit nicely. Interesting on the materials ~ the Jack's I have on now are all leather and the leather is just as colorful as my Bonanno's so I haven't found that to be true. I know there is a lot of info flying around out there about this style of sandal and its maker. The Bonanno name has been highlighted due to the family drama. It's a shame. I have also been told the soles are made from different materials. Great post! What a great post! I loved learning that the SBSs are made here. That's fantastic!!! So funny just read Susan's blog with the very same topic! Great minds must think alike huh? What a great look at an adorable product! Thanks!! There is only one ...and none other compare ! Its Bonannos or its Barefoot ! Wow... I learned a whole lot in the 10 minutes it took me to read this post! Thanks so much for writing this! I always thought that Jack Rogers came first.. Now I know the truth..